I had been trying for years to capture an image of Bierstadt Lake and the Continental Divide with fog clearing after a previous nights storm. 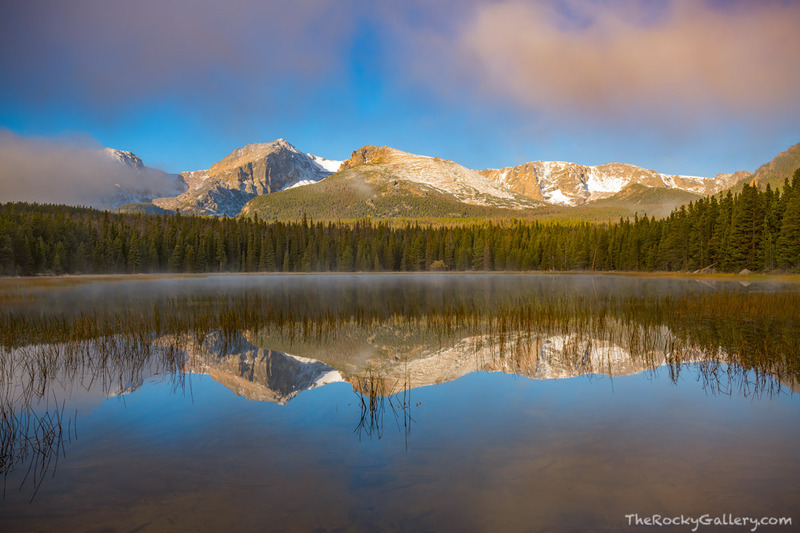 Finally on a cool September morning I stood on the shoreline of Bierstadt Lake in the fog and mist hoping the clouds would break to reveal Otis,Hallett,Flattop and Notchtop. Shortly after sunrise I was blessed with clearing skies and bright beautiful sunrise. The mountain peaks were dusted with some light snow the night before this perfect morning in Rocky Mountain National Park. Photo © copyright by Thomas Mangan.